After a week of seeing news video footage and newspaper photos of people with masks on so they don’t catch the “swine flu”, I feel I have to let out a little secret known to those who work in or alongside the medical field. 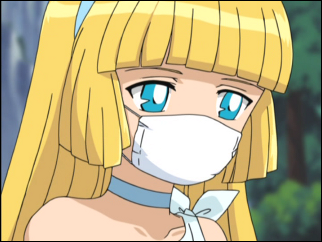 That mask isn’t going to keep the flu out. It’s meant to keep a sick person from spreading things when they cough or sneeze. If you’re not sick, you can still catch the flu while wearing one of these. Let the unnecessary pandemonium resume. One of the numerous reasons I started The Pink Sylphide was to get myself to write more often. For a good length of time, it served that purpose well. It also helped me analyze more thoroughly what I’m watching. In the last year and a half, however, I’ve taken up photography as another hobby. This cuts into my time for my other hobbies. I’m a fan of targetted advertising. Advertising in general I can easily skip over, but targetted advertising done right is great stuff. Right Stuf! has released their Spring 2009 Anime Catalog (available via their web site as a PDF, which is awesome). Every once in a while, you come across a series that was so well put together, you just know it will stand the test of time. Enter Haibane Renmei. Expect spoilers, so please avoid this post if you haven’t seen the series.